We've all heard that we should drink more water to lose weight. But if you're like many dieters, you often grab a soda or a sports drink because it tastes better. Wouldn't it be great if you craved water the same way you crave sweetened beverages? Well, you can with a few simple tricks. 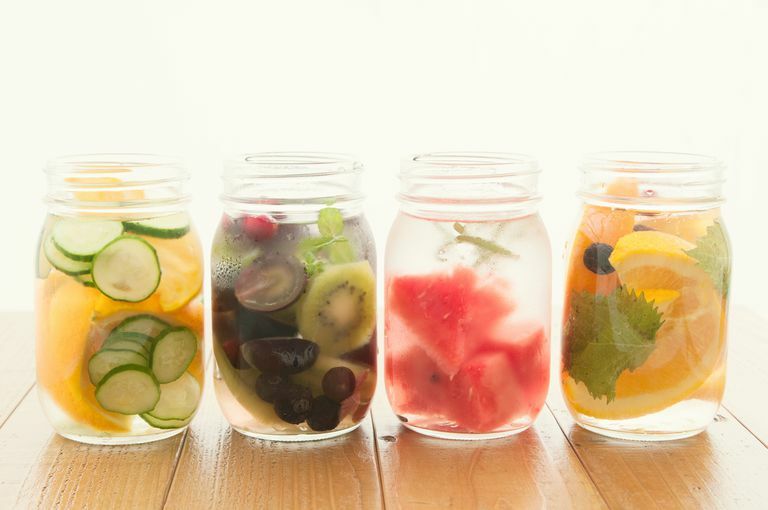 Use these healthy flavored water recipes for weight loss. Flavored water that you buy in the store often contains added sugar or artificial sweeteners. The products are often a source of empty calories that will derail your diet. So why not make your own healthy flavored water at home? Your own healthy water recipe can be as simple as putting frozen strawberries in water or as complicated as combining savory herbs and vegetables. The key is to experiment with different flavors until you find one or two that you really enjoy. Try any of these combinations. Add frozen berries to water. Why bother with boring ice cubes when you can add frozen berries instead? Frozen blackberries, strawberries, raspberries, and blueberries keep your water cold and add flavor. They also add a pop of color to your drink. You can either add a few frozen berries directly to your water (buy them in bulk at the grocery store) or use ice cube trays to freeze berries into cubes. Berry flavored water will help to reduce your cravings for sweet treats and you may even save money and avoid waste in the process. Take fresh berries that are going bad and throw them in the freezer for later use. Make cucumber water. If you prefer a flavor that is less sweet, then you'll love cucumber water. Simply add a few slices to your glass and the subtle flavor gives your water a fresh, spa-like taste. If you have more time, fill a pitcher with a handful of cucumber slices and let it sit in your refrigerator. The cool flavor will help you skip the urge to drink a cold soda or crave junk foods. Try freezing cucumber slices to add to water instead of ice cubes. Make orange water or add other citrus flavors. Lemons and limes can make your water look more sophisticated and add a hint of flavor, but don't forget about other citrus fruits. Oranges, grapefruit, tangerines, and mandarins also taste great in water. Keep a bowl of fruit slices in your refrigerator to mix and match throughout the day. My favorite combination is orange and basil. Add a few slices of orange and a few sprigs of basil to a pitcher of water and let it sit for an hour or two. The mixture sounds odd but this delicious water recipe kills my cravings for salty savory foods. If you prefer a hot drink, add a slice of lemon to hot water in the morning. It makes a great pick-me-up that adds no calories. Make mint water. Make refreshing mint ice cubes by throwing a small sprig of spearmint, peppermint, or lemon mint into the ice cube tray, then add water and freeze. You can also make these healthy flavored water cubes with your favorite herbs, like rosemary or basil. This water recipe is best for people who don't like sweetened beverages but still prefer some flavor. And sometimes the taste of mint can reduce your urge to snack so this healthy water is great for weight loss. Juice cubes for children (or adults!). If you're trying to cut back on sweetened beverages in your home, try this trick. Kids love it and you will too. Grab your favorite juice and freeze it into cubes. Lemonade also works well. Then toss the colorful cubes into a glass of water when you need a drink. You'll get some of the flavor from the juice but far fewer calories. You can blend flavors too. Throw colorful cubes of orange juice and lemonade into a tall glass of water and enjoy. When you start to drink more water, you'll find that you drink less soda, less coffee, and fewer high-calorie drinks. You'll notice three health and weight loss benefits. Drinking more water helps you to feel full throughout the day so you eat the right number of calories from snacks. And while you might drink water to lose weight, you'll find that it's good for your wallet as well. Have you ever thought about the annual cost of your soda habit? The total cost of your daily soda may be more than you realize. So, for the sake of your waistline and your wallet, give these healthy water recipes a try. Does Drinking Water Really Help With Weight Loss?